LET US DO ALL THE WORK!! Call or e-mail Platinum's 24 hour request lines now! We will send you listing reports that contain the complete street address. One call and We guarantee to do it all. The Perfect Blend! An impressive, low-maintenance home located in an active lifestyle community! Former Model-lots of upgrades. MBR , 2nd BR & two full baths located on ground level, first floor. Dramatic volume ceilings. Open Floor Plan. Spacious eat-in kitchen w/center island, Granite, custom tile backsplash, SS appliances. Adjacent to Grand Family Rm, w/gas fireplace, wall of windows- light and bright. Impressive covered paver patio with 2 exterior ceiling fans, mountain views and lush landscaping. Generous sized loft & third BDRM w/adjacent full bath & walk in closet. 20 x 8 storage room. Community amenities include a heated outdoor pool, clubhouse, tennis and more. 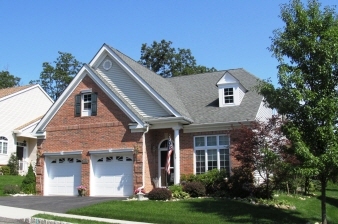 Convenient to shopping, Mt Arlington train station, major transportation routes. Floor Plan and Feature Sheet available at property.